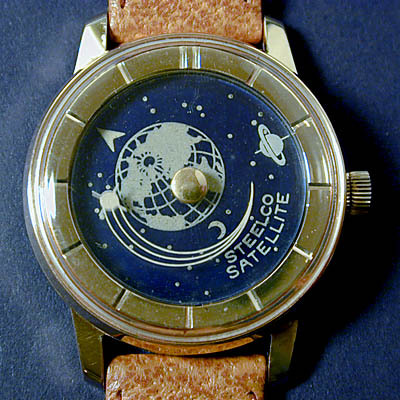 This watch was produced by the Steelco Watch Co. in 1957 to commemorate the Soviet Union’s launch of the Sputnik satellite. I had never seen one of these watches until I happened across this example at a vintage watch web site, and I have not seen another one since. I have been told, but I can’t confirm, that this watch is somewhat rare and collectable. This watch was an impulse purchase, and I’ve owned it for about 18 months. I believe I paid $350. I am attracted by the unique time display. This watch is unlike any other watch I’ve seen. This is a so-called “mystery dial” watch, hence the plural “dials” in my heading. In fact, as you can see in the scan below, this watch has two clear mystery dials plus a third blue dial, or one dial each for hours, minutes and seconds. Obviously, each of the dials turn. The time is indicated by symbols painted on each dial. The top disk (furthest from the movement) is clear, and it bears a small image of Sputnik with a trail behind it. Sputnik marks the seconds as it speeds around the dial. The center dial is also clear, and it has an image of Saturn and its rings, plus a rather artificial line through the planet’s axis which helps show the minutes more clearly. The bottom dial is dark blue, and it bears several images, including the earth, moon and stars, the manufacturer and model names, as well as a small triangular shape which marks the hours. In the first scan above, the indicated time is 10:10:43. The two clear mystery dials have retained much of their clarity. They are not noticeable when you look at the watch under normal conditions. 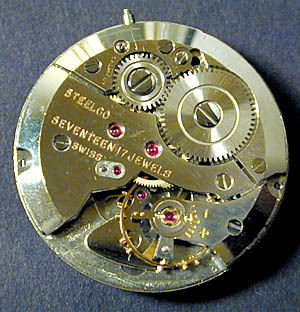 This watch has a manual winding movement stamped Steelco, Swiss and 17 jewels. The movement is undecorated, and the plates and bridges have a brushed finish. The balance wheel is screwed and it appears that an Incabloc shock protection system is employed. The movement is in good condition and does not show any signs of abuse. The finish is adequate but not refined. I have not timed this watch recently, and as I write this review the watch is in the shop for a minor repair so I am unable to provide a current time keeping figure. 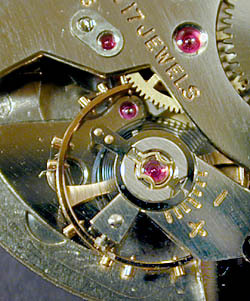 The watch was sold with the usual vintage notation: “keeps time to 2 minuets per day or better”, and the watch performs within that range. To be honest, this is such a fun watch, I don’t really care how well it keeps time. I just like looking at it. This a unique watch with some historical significance and rarity, all for less than many modern watch bracelets cost. This is a great example of how you can get an interesting watch with a great look for a relatively small sum by buying vintage.